This text provides a comprehensive introduction to the entire range of semiconductor devices and examines their applications, assuming only the minimum mathematical and electronic background. It covers a full year's course in power electronics. 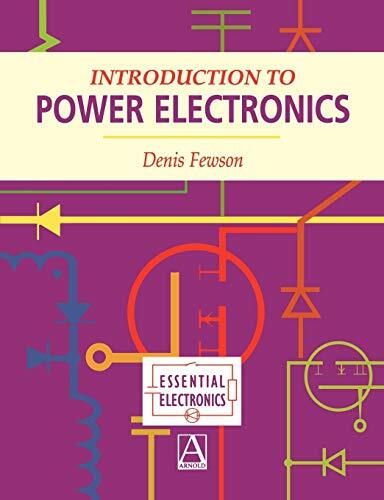 Building on solid state device and electromagnetic contributions to the series, this text book introduces modern power electronics, that is the application of semiconductor devices to the control and conversion of electrical power. The increased availability of solid state power switches has created a very rapid expansion in applications, from the relatively low power control of domestic equipment, to high power control of industrial processes and very high power control along transmission lines. This text provides a comprehensive introduction to the entire range of devices and examines their applications, assuming only the minimum mathematical and electronic background. It covers a full year's course in power electronics. Numerous exercises, worked examples and self assessments are included to facilitate self study and distance learning.